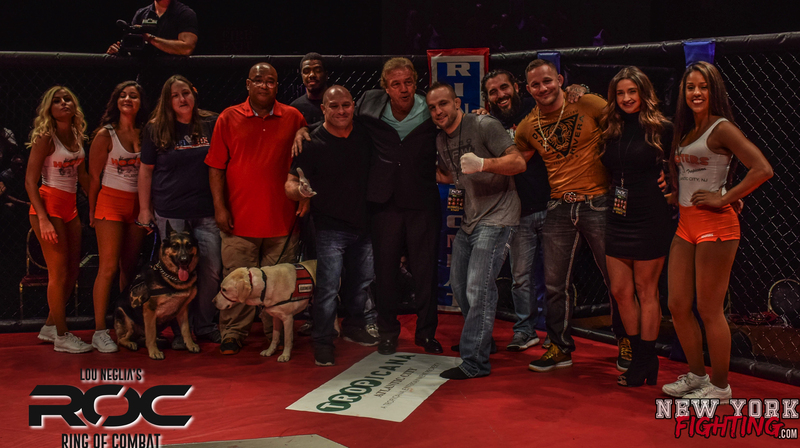 Two Titles Change Hands At ROC 56 | Lou Neglia's Ring of Combat | Next Generation of Mixed Martial Arts! It was a crazy night inside the showroom at the Tropicana Atlantic City Casino. MMA was at its best when the fighters from the ROC 56 card stepped inside the cage. Fight fans witnessed devastating knockouts and spectacular submission wins. In the end, two titles changed hands when Shelton Graves Ko'd long-time heavy weight champion Brendan Barrett with a 3rd TKO and Eric Roncoroni lost his middleweight title to Ruslan Melikov via unanimous decision. In an evenly matched fight, featherweight champion, Frank Buenafuente's ground game became the difference as he scored spectacular rear naked choke over Nekruz Mirkhojaev in the second round. Bradley Desir also held on to his title over late replacement, Julian Lane , with a series of unanswered strikes. Check out the photo gallery from ROC 56 provided by New York Fighting for more great action shots!